Art, History, Recycling and Cubism. Recycling has been happening as far back as the 20th century when the cubist movement was in motion. It was the early part of the 20th century when artist and designers started to incorporating recycling. It was around the time when Cubist artist found a new ways' of using materials to represent and produce new works of art or design. The cubist art movement was one of the most radical revolutions since the renaissance; it was a start of a whole new language, a totally new way of seeing and experiencing art and for artists to create and express themselves in a revolutionary new way. This ground braking movement was shaping and adapting the way for the 20th century art world, and the new way of using materials was changing, allowing artists to be freer with expression. It was a time for abandoning the old system of perception and the related conventions for reprinting realism. For instance the approach to painting was shown less as a porthole in to the world than as subjective answer to the world. The actual approach of art for this time would be to present objects as assemblages of geometrical shapes which the artist would look for multiple view points and would become fascinated by the materials or objects, attentive to movement, creating feelings of realness in their work which related to everyday things. The Cubist art movement was created by an artist named "Cezanne" who would look at things as if they were shapes. He would develop his artwork from shapes, linking the natural with shapes such as cylinders, spheres or cones and in such a way to create a art work. Artists such as Picasso and Braque were truly influenced by this, a new way of thinking and they developed it within their own style which still influences art and design to this very day. I have always been interested in artists such as Picasso, Braque, and Duchamp who created sculptures and collages from left over materials such as newsprint, wrapping's, and labels; or found items and materials such as broken glass, bike parts, scrap metals and leftover wood. They used any scrap materials, which they thought could be given a new lease of life within their work. 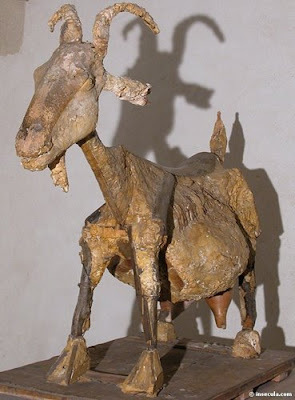 Through out Picasso's career he had assembled found objects to make new and unique sculptures such as one of my favourite's "The Chevre"
Pabblo Picassos 1950 "The Chevre"
He has reassembled old bike parts to create a sculpture which represents a goat. Another artist which I have always found inspiring is "Kurt Schwitters" he assembles found items in a collage with painting. 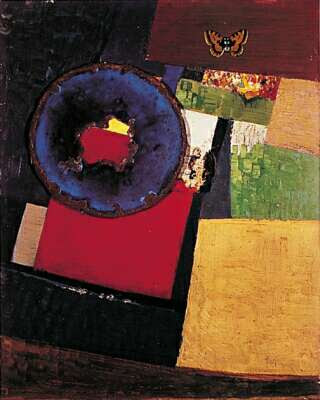 My favourite piece by Schwitters is the "Maraak, Variation"
It is an example of both collage and oil painting. Hidden within are items such as printed tickets and flat things which he has collected and assembled in to an almost abstract painting which mirrors the ticket like shapes. I especially love the butterfly in the top right corner it looks slightly out of place but it makes the painting for me.